Laminate flooring is one of the easiest surfaces to clean due to the powerful aluminum oxide top coating that resists stains and harsh chemicals. Although it is easy to clean, routine maintenance is still necessary! There are a few tricks to know when it comes to daily cleaning and tougher stain removal. Below, we will outline how to clean laminate flooring and list some of the most common stains and how to remove them from your laminate floors. By knowing the common tips and tricks on how to clean laminate flooring and remove stains, maintaining your floors will be a breeze! Sweep using a broom, microfiber mop or a dry vacuum to pick up loose debris on your floors. This is especially important if you have pet hair or dirt on your floors. Sand, rocks and other loose debris could cause scratching if tracked through your home. If you are using an electric vacuum, be sure you do not use a beater bar on your laminate floors. Brand Name Flooring Solutions —Depending on your laminate flooring, your manufacturer may make a brand specific cleaner, such as Armstrong Laminate Floor Cleaner or Alloc Free and Clear. These are great options since they are formulated and created by laminate manufacturers specifically for laminate floors. Store Brand Cleaners —These are cleaners you can buy at any grocery store or any super center. Generic store brand mopping solutions should specify the types of flooring it can be used on. Natural Solution —A natural solution of 3 parts water to 1 part vinegar is our favorite method of cleaning. Due to the acidity, it can remove stains and build up easily, without any harsh chemicals. Cleaners to Avoid — Be sure to avoid Orange Glow cleaners and any cleaners with conditioners, lotions, or waxes. These solutions can leave streaks, grease marks and dull the laminate flooring’s appearance. Dry any damp areas. Laminate is not waterproof, and you risk damage if excess liquid enters the locking system. It is important to use a cloth to dry any excess liquid. Along with weekly maintenance, you will probably run into spills from time to time. To clean up a small spill of liquid on laminate flooring, simply get paper towel or cloth and wipe it up. If you have a sticky or staining liquid, try the solution of 1 part vinegar to 3 parts water. We recommend keeping a small spray bottle handy for quick clean-ups! It is important to dry any excess water or solution mixture with a dry paper towel or cloth to avoid water damage to the flooring. If your laminate flooring is being installed in an area with possibility of spills, such as a kitchen or playroom, it’s recommended to seal the planks along the edges with a wood glue to protect the joint and locking system. A natural homemade stain remover and cleaner is a great thing to have handy when those unexpected spills happen. We love having a small spray bottle in the kitchen or laundry room for quick access. We recommend a vinegar and water solution. Cleaning with vinegar helps to tackle grease, soap scum and oder. To make your own vinegar solution: Mix 1 cup of vinegar with 1 gallon of water for large areas and deep cleaning. For smaller spills and quick clean-up, use a spray bottle (around 32 oz) and fill with 1/4 c. vinegar and fill with water. Spray on the spill and wipe using a cloth, microfiber towel or paper towel. With kids, pets and a busy home or office, spills and stains are bound to happen. If you have carpet, you already know how tough some stains can be to remove! Luckily, laminate flooring has a durable top coat that helps protect against damage, and can withstand chemicals needed to remove some staining agents. We’ve tested many household scenarios to give you a helpful guide on cleaning stains on laminate flooring quickly and easily. Most household spills and stains can be easily cleaned with a water and vinegar solution, or acetone. 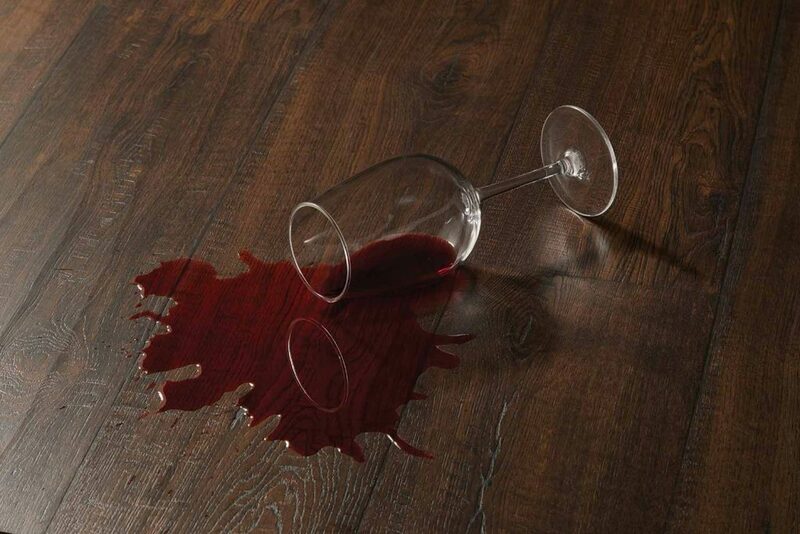 Coffee, Wine, Juice: Wipe up the spill immediately to avoid any damage to the flooring. Soak any liquid up with a clean paper towel. Spray a a vinegar and water solution onto the remaining spill and wipe with a paper towel until clean. If you find dry spots of these stains, this method will also work. Wax: Candle lovers, rejoice! Your laminate can handle some spilled candle wax. Wait until wax is completely dry, and use a non-abrasive scraper, such as a rubber scraper or plastic putty knife, to remove the wax from your floor. After you remove the wax, wipe the floor with a vinegar-water solution on a paper towel or micro-fiber cloth. Furniture Polish / Dust Cleaner: Dusting your home is another necessary cleaning routine. If your dusting spray makes its’ way onto the floor, you could end up with a slip hazard. Simply spray a vinegar-water solution onto the floor, or onto a paper towel, and wipe until the area is no longer slippery. Goo Gone: If you use Goo Gone to remove something sticky, it may leave a residue on your floor. Wipe the area with a vinegar-water solution and clean paper towels until area it is clean. Permanent Marker & Pen: Drawing on your floors isn’t as big of a deal on your laminate floor, as it may be on your walls. Use acetone or a nail polish remover with acetone in it, and pour on a clean paper towel. Wipe the laminate flooring in a scooping motion until all visible marker is gone. For tough areas, keep using acetone and fresh paper towels until area is clean. Kid’s Oil Paint: Do you have a little artist at home? Be sure to try and clean up paint before it dries to avoid staining in grooves and on lighter flooring. Use a dry paper towel in a scooping motion to eliminate excess wet paint without making the area larger. Spray a vinegar and water solution onto paint on floor and wipe with clean paper towels, using a new paper towel each pass, until clean. Nail Polish: If you spill nail polish, try to clean it up as soon as possible. Use acetone on a clean paper towel. Wipe the nail polish up by using a scooping motion until all visible nail polish is gone. Use more fresh paper towels and acetone in a swiping motion to get into any grooves or textured areas. If left to dry, nail polish could stain your flooring. Glue: Arts and crafts accidents can happen! If glue is spilled on your flooring, wipe the glue up immediately. Use acetone on clean paper towels to wipe floor using a scooping motion until all visible glue is gone. Finish the floor with vinegar-water solution to remove the residual glue residue. Once glue is dried, it can be extremely hard to remove. Scuff Marks: Scuff marks can be treated a few ways. First, try a white eraser and follow with a water and vinegar solution. You can also try adding Goo Gone to a paper towel and rubbing the scuff mark. Wipe with the water and vinegar solution to remove the residue. If you have a tough stain that you can’t seem to get out, contact one of our flooring experts. We’ll help you find the best solution for your hard-to-clean dirty spots. If you have a question on this or any other type of cleaning solution, please call us at 1-800-520-0961. We’ll be happy to talk about how you can keep your floors looking great for the long-haul.